E-health is closely related with Networks and Telecommunications when dealing with applications collecting or transferring medical data from distant locations for performing remote medical collaborations and diagnosis. 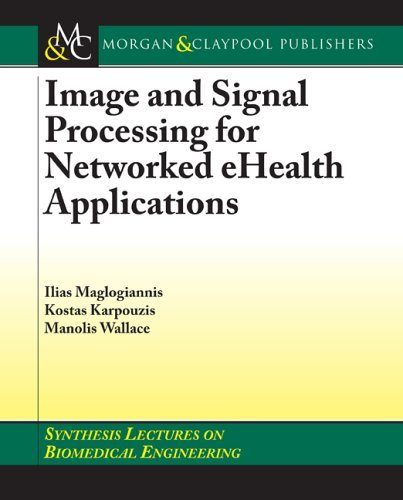 In this book we provide an overview of the fields of Image and Signal Processing for Networked and Distributed e-health applications and their supporting technologies. The book is structured in 10 chapters, starting the discussion from the lower end; that of acquisition and processing of biosignals and medical images (chapters 2 and 3) and ending in complex virtual reality systems and techniques providing more intuitive interaction in a networked medical environment (chapter 10). The book discusses also networked clinical decision support systems (chapter 4) and corresponding medical standards (chapter 5), WWW based applications (chapter 6), medical collaborative platforms (chapter 7), wireless networking (chapter 8) and the concepts of ambient intelligence and pervasive computing in electronic healthcare systems (chapter 9).